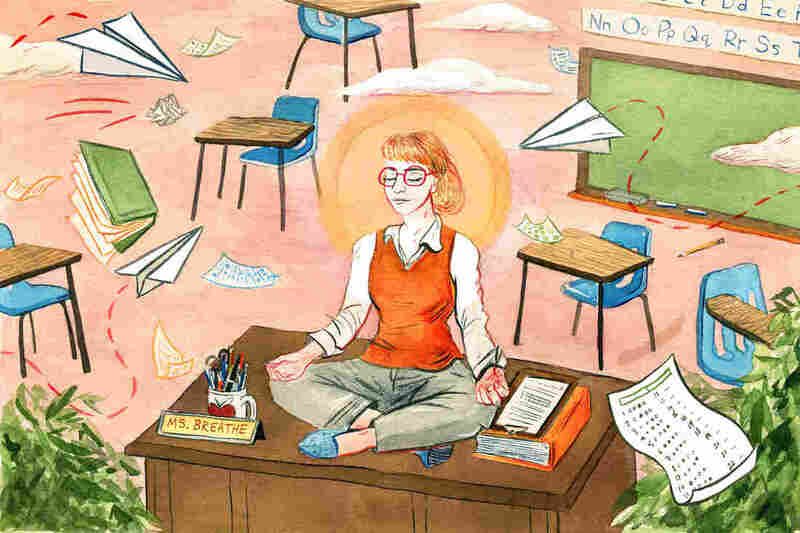 When Teachers Take A Breath, Students Can Bloom : NPR Ed An evidence-based program teaches mindfulness to educators. Research suggests it can reduce their stress and improve their teaching. For the past nine years at this annual five-day summer retreat, and now within schools, CARE for Teachers teaches what's called mindfulness: calming the body and mind through breathing and movement, and using insights from psychology to better regulate your emotions. They do a series of role-playing activities to practice listening and conducting difficult conversations with a boss, fellow teacher, parent or student. It's the first mindfulness program to be studied with funding from the U.S. Department of Education — and aimed at teachers, not directly at students. Teaching is inherently a stressful occupation, and by many accounts, it's getting more so. Students bring the effects of poverty and trauma into the classroom. Administrators lay on the pressure to meet ever-changing standards. In the last few years, teacher job satisfaction has reportedly plummeted to a 25-year low, and turnover is high — almost 50 percent for new teachers. Patricia Jennings isn't necessarily out to change all these factors. Instead, she aims to help teachers become the change they wish to see in the world. Then, as a college student in 1970s Arizona, she discovered Zen meditation. "I started realizing that a lot of the suffering and anxiety I was feeling — that those thoughts were not me," she says. "That was a huge revelation, to go oh, this feeling of dread is a result of this experience, but it's not who I am and I can let those thoughts go." Jennings studied at the Buddhist Naropa Institute (now Naropa University) in Boulder, Colo. She earned a degree in psychology and a teaching degree, then founded a Montessori school where she taught kids meditation as early as 1980. Even more interesting effects came from classroom observations. When teachers were more mindful, "yelling went down," says Jennings. Classrooms were rated more emotionally positive and productive. Students were more engaged. Bonnie Kirkwood and Michele Coyle-Hughes work at P.S. 279 in the Bronx. They spent the school year that just ended helping teach CARE techniques to their colleagues. They are back at the CARE For Teachers retreat to figure out how to spread it further. As part of the student support staff, "I deal with teachers in crisis," says Coyle-Hughes. "I can see that they need more tools." "Our kids gravitate to our building because they want structure and routine," says Coyle-Hughes. Kirkwood, a reading specialist, says the CARE techniques have improved her relationships with students and colleagues. "I'm learning to let go and let God," she says. "When administrators call you, you never know what they want. It could be a parent is upset with you, or you forgot something," she says. "I used to rush to meetings, grab a seat, and jump in. Now, I practice mindful walking. I think about where I'm going. When I arrive, I'm not revved up. I'm able to receive criticism or conversation without being triggered." In the training, CARE participants talk a lot about "triggers" and "scripts" and being "reactive." Past experiences may shape your perception of a situation, and bring on too-strong or inappropriate emotions. If you are "reactive," you'll succumb to those emotions, following the unconscious script in your head. If you are "reflective," you'll be able to pause and get a more accurate read on the situation. In one session Jennings tells a story recounted in her book, Mindfulness for Teachers, of a previous CARE participant who was immensely bothered by a 7-year-old student who was late every day and disrupted the whole class with laughter. On reflection, the teacher remembered that in her own family, there had been severe punishments for being late. She sat down and talked to the girl and learned she was the daughter of a single mother who worked nights, so the little girl was responsible for getting herself to school every morning. And her giggling wasn't intended to be disrespectful — it came from embarrassment. After a lunch of beet salad, quinoa and garden greens, the teachers disperse outside for a walking exercise and paired discussions. Here amid the wildflowers and butterflies, it's easy to feel tranquil. But in a few short weeks a new school year will be starting. "I can feel my heart start to race when I think about September getting closer," one teacher says in a session. "In September there is NO space. If you were walking into an inner-city urban school this September, what two CARE practices would you bring?" she asks Jennings. And the second answer was cultivating a daily practice in breathing, mindful walking, yoga or other relaxation discipline. "That helps you remember to take the three breaths when you need it!" When it's time to move on to lunch or PE, get students to take three deep breaths and then listen to the sound of a bell. Have students listen quietly until the sound fades away before moving on.